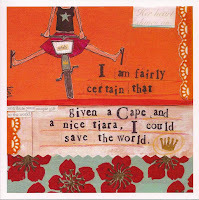 Perhaps not the world, perhaps not saving anything at all really, but a cape and tiara would go a long way toward outfitting me for my new gig. An event facilitator needs to demonstrate a certain style, don't you think? But regardless of whether I end up wearing my ermine stole or my mom jeans to work, I am thrilled to be joining the Cantos Music Foundation. How could I not be? I am in love with the vision. The vision of a National Music Centre, amplifying the love. The vision of magnificent architecture which will celebrate Canadian music, a convergence of the old home of the blues and the new buzz of the East Village. I had my training yesterday, met many cheery like-minded folks, and got a glance at the incredible instrument collection. How I long to play that Theremin. Later this week, I will work my first shift. Still debating the cape and tiara. - partial contribution to an article about the Telus Spark/Mayor's Urban Design Awards appearing on EV Experience. It's a marriage of my scribbling and my editor's sassy style. She has a knack for swooping in and making everything infinitely more awesome. Even if if does mean dropping my Uranus joke. I am so stoked for you, Barb! You go girl! I want to hear all about this gig! Not a bad suggestion, WC, but I am more of a Clarks girl myself. Bigger on comfort than style. I'm very excited about it, Mr Anchovy. It's a casual position, helping out when the performance space is rented out to various organizations. A very cool place. I'm jealous. Now I"ll be hearing all about the cool events about town in STEREO! You have to plan a trip up here to see some of the instruments, Leazwell. It's a candy shop, I tell you. And hopefully joining in on some of those stereo events, UB! How great for you! Enjoy, Barb! The new job really does sound like the perfect fit. I hope training is going well this week! Let me know if you need an extra cape. Thanks, Leslie, I think it's going to be a blast! It never hurts to have access to an extra cape, Al. Thanks, I may need to take you up on that. There's a busker in the Toronto subway who alternates between playing the bassoon (with a pedal for loops a la Final Fantasy) and playing the theremin. So cool to hear while walking through the tunnels. To hear a theremin while walking through a subway tunnel would be utterly otherworldly, Remi. Lucky you!